Disclosure: I am honoured to be a part of the Orange Naturals Mom Ambassador Program and I receive special perks as part of my affiliation with this group. The opinions on this blog always are my own. 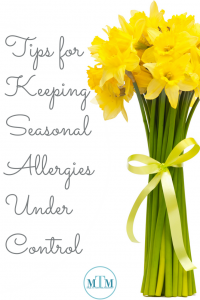 In this post, I’m sharing my experiences with seasonal allergies and providing you with some suggestions to consider in order to reduce your allergy symptoms. Since having babies, I have been blessed with experiencing a range of seasonal allergies. Some seasons are worse than others. One Spring, my one eye was so swollen and itchy for a couple of months, that was not fun! I have learned that there are some things that we can do in our daily lives to reduce our exposure to allergens and therefore potentially reduce allergic reactions. Rinse your nasal cavity often. Shower at the END of the day. Wash your clothing regularly (including your spring coat). Avoid wearing your outdoor shoes in your house. Reduce the temptation to open your windows during high pollen times. When seasonal allergies hit you hard, and you are experiencing those nasty symptoms such as itchy eyes, stuffy nose, runny eyes and difficulty breathing, you may want to consider using Orange Naturals Seasonal Allergies. You will likely enjoy the fact that this is a non-drowsy formula and made with natural ingredients, I know I sure do. 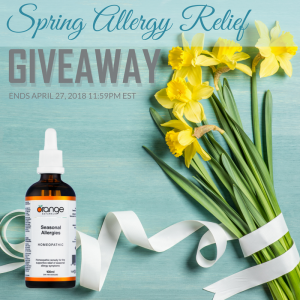 I’m excited to have the opportunity to offer one lucky winner a Seasonal Allergy Prize Pack! By entering the following contest, you are accepting that if you win, your contact information will be shared with Orange Naturals for the purpose of mailing your prize. Please allow 4-6 weeks from the contest closure date to receive your prize. This giveaway may appear on other blogs as part of the #orangenaturals Parent Ambassador program. however, be fair, you can only win once per giveaway. If your name is chosen more than once, another winner will be selected. All winners must be from within Canada. The suggestions and tips on this blog are just that; suggestions. These are tips from an experienced Mom who is passionate about inspiring and helping other Moms. Please know that not all suggestions are recommended for every child AND not every tip or suggestion will work for every family. Take in the information and decide what works best for you, your child and your family situation and good luck! If you ever find yourself struggling and would appreciate some support from like-minded, supportive Moms, please connect with me over in my Parent Support Group. Tagged allergies, itchy eyes, runny nose, seasonal allergies, seasonal allergies symptoms, spring allergies, stuffy nose. Bookmark the permalink.